In the United States and the rest of the northern hemisphere, the first day of the spring season is the day of the year when the Sun crosses the celestial equator moving northward (on March 20th or 21st). This day is known as the Vernal Equinox. 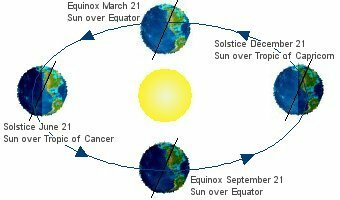 The declination of the Sun on the vernal equinox is 0° 00'. 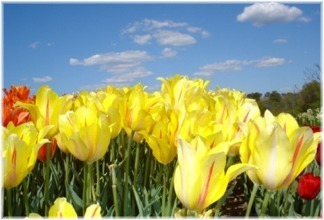 On the day of the vernal equinox, day and night are nearly the same amounts of time. In the United States, there are about 12 hours of daylight on this day. March is the traditional start of tornado season in the United States. Although tornadoes can occur at any time throughout the year, the peak activity period is March through early July, according to the National Weather Service (NWS). An average of 1,200 tornadoes touch down in the United States each year, and most of them form during this tornado season. Because these storms kill about 70 Americans annually and injure some 1,500 others, disaster experts urge families to be prepared — particularly those who live in Tornado Alley. Tornado Alley is roughly defined as the area of the Central Plains from Texas to Nebraska. This is where most tornadoes form each season. 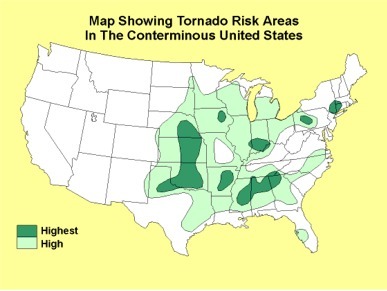 Much of the damage that tornadoes inflict each year occurs in this region of the country. Texas has the highest number of tornadoes, with an average of 124 each year. Ready - Ready.gov is a national public service advertising (PSA) campaign designed to educate and empower Americans to prepare for and respond to emergencies including natural and man-made disasters. The goal of the campaign is to get the public involved and ultimately to increase the level of basic preparedness across the nation.